As I was writing yesterday’s story, my wife sent me a link for inspiration for a future story. 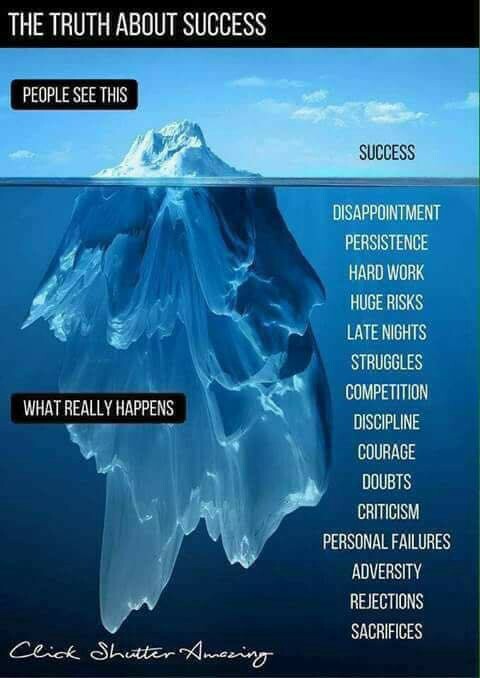 It was an image that summarizes a lot of what myself and a lot of other writers here say about “success”. When we think about high-profile successful people, we only see their current success, but not their struggle to get to where they are today. EVERY successful person had to go through a lot of hardships to get to where they are today. And success is only a state, it changes. Successful people continually have to work hard to keep their “status”. I personally love this image. I’m not the most successful person out there, but I like to remind myself sometimes that when things are rough, maybe I’m just one step closer to “success”. By going outside the norm, you’ll disappoint people you live a normal life. You will also disappoint yourself a lot along the way. This month has been very disappointing for me. Because I was on the move almost on a daily basis, I didn’t manage to stick to my routine and completely lost my momentum. This is where most people fail. Persistence is about executing consistently and never giving up. I am personally not very persistent, which is surprising to say for someone who has worked on the same game for 4 years. But outside Soul Reaper, I almost “give up” everything I do. I like to try new things all the time. What are you persistent in and what are you not persistent in? When I could follow my routine, I was working at least 50 hours per week on Soul Reaper. I was: writing one story a day (I still am), learning Norwegian, doing 100 pushups, squats and dips (I still am), journaling, meditating, recording podcasts, working on a text-to-speech startup, and more. How do you work hard? Getting out of our comfort zone is a habit not many people dare to try. We are not programmed to make decisions that can break us. Successful people make huge bets that ultimately paid off. Last June, I quit my job to become a nomad and work full-time on my game, which still hasn’t made a single dollar. I employ 8 people, all of which I pay. I have yet to make money for that business. I’m not aiming to get all the money I spent back, but I’m hoping some people will at least enjoy the work we’ve done on Soul Reaper. What huge risks are you taking? I’ll rephrase that one: working long hours. Successful people don’t count the time. When they look at their clock, it’s not because they’re eager to stop working — they’re afraid that they won’t have time to finish what they started. When you combine all the productive activities I do, I work around 100 hours per week. For reference, there are 168 hours in one week. I gladly do more as needed for important deadlines. How many hours a week do you put towards your productive activities? Nobody is perfect. Everybody struggles to do things they’re not familiar with. It’s how you overcome your struggles that makes or breaks a champion. Arnold Schwarzenegger struggled to build mass in his calves. He analyzed competitors, worked long hard hours and overcame it. I currently struggle to write one story per day. If I look at my Medium stats, I’ve written 141 stories. That includes the responses I write, but some of them are genuine answers. I’m a game developer, by trade. Writing is not something I can do that easily. We’re all competing against other people who have the same goals. Sometimes it’s an active act, but a lot of times it’s passive. At heart, I’m far from a competitive guy. Indirectly, I’m competing for attention here on Medium. There are so many good writers out there, so when a reader chooses to read me, they chose to read me over other people. For Soul Reaper, I’m competing against other games of the same genre. What do you compete in and where do you stand in that competition? I see discipline as an obsession. Do you obsess over your goals? Do you quantify and qualify everything? When I had the goal of gaining 5kg of mass in one month (it’s extremely hard for an ectomorph), I needed discipline. I needed to eat a lot of good, healthy food, workout all body parts consistently and quantify gains in all aspects of my body. I ultimately succeeded thanks to the obsession. Do you quantify and qualify your goals? Courage is the ability to do something that frightens one. It’s about having strength in the face of pain or grief. Going back to the 5kg of mass example, after 21 days, I was behind on my gains. I had gained half of what I wanted to gain, but there were only 5 days left of my workout. I was very close to losing hope that I could do it. It was already insanely hard, but I had the courage to step it up even more. On the last day, I had reached my goal, and lost 2% body fat along the way. Do you strength in the face of pain? Everyone has doubts about themselves, about the things they’re doing. Doubt, when “used” properly, can lead to making better, more informed decisions. I constantly doubt the success of Soul Reaper. The thing about video games is that the main criteria for a good game is the fun factor. Yet “fun” is very subjective. There’s no way to quantify it scientifically. But by doubting it, I constantly try to figure out new ways to make the game more fun. Do you doubt the things you’re doing? Not everyone will agree with what you are doing. There will come a point where people will criticize your work, your beliefs, etc. I’ve been fortunate enough in my writing that as I’m writing this, I’ve only had 3 bad comments. But every time I get one, I’m happy. Criticism is a sign of success. When people take the time to write their opinion, good or bad, you’ve made an impact on them. Do you get criticism for things you do? Outside of our productive activities, we’re all people. We have “a life”. As we reach a higher level of “success”, more personal failures will occur; broken relationships, staying healthy, staying motivated, etc. I try so many things that I ultimately “fail” at 90% of what I do. Personally, I’ve lost friends along the way. I don’t live a conventional life and because of that, I tend to disconnect from people who live one. Where have you failed in your personal life? We all face events that are outside of our control. Some people say they’ve got bad luck, or even go so far as to say they’re cursed. Successful people recognize that some things are out of their control, but still prepare for the eventuality that said misfortune could happen. I’m such a positive person that it’s hard for me to find a personal example of adversity in my life. I find lessons in all “bad” experiences. What adversity do you face? No. No. No! To become successful, you’ll get rejected many many times. Tim Ferriss reached out to over 18 publishers for The Four-Hour Workweek. They all said no. The 19th said yes. You will get many “no” until you get the “yes” you’re seeking. Be persistent. I’ve been rejected for jobs I felt highly qualified for. But I take responsibility for it. I was just not prepared enough. In my outreach efforts for Soul Reaper, many have just ignored my requests, the others said no. That doesn’t stop me from trying. How many times were your ideas rejected? Every successful person makes sacrifices — Money, relationships, time, etc. It is those who dare sacrifice what they cherish most that will reap the fruit of their labour. I sacrificed the comfort of a stable home in order to save money. Life in Toronto is so much more expensive than life in Cambodia, Spain or India. With that money I’m saving by having lower standards, I can invest in my other ventures. What sacrifices are you making? On your road to success, you will face the above 15 things. It’s how you tackle them that will make you successful. Are you doing what successful people do? Are you struggling to answer the questions above? Fight disappointment, be persistent, work hard, take huge risks, put in long hours, combat struggle, win over competition, be disciplined, have courage, remove doubts, accept criticism and personal failures, understand adversity, fuel off rejection and make sacrifices.